A Giulianova Lido in the central area adjacent to Viale Orsini, for sale studio apartment on the ground floor of elegant building. The property for sale is the result of a recent renovation that allowed to organize the environment in an excellent and functional. The internal layout allows you to use the space comfortably and then you can take advantage of useful spaces both for the living room and for the night part. The bathroom, also redone, has a window and has a shower. The property is completed by a cellar. This studio for sale in Giulianova Lido, Via Cairoli, Viale Orsini, is perfect for those looking for a nice and small living solution to spend their holidays, but also for those looking for a property as an investment. The entire furniture is included in the price. A Giulianova Lido in the central area adjacent to Viale Orsini, for sale studio apartment on the ground floor of an elegant building. The property for sale is the result of a recent renovation that allowed to organize the environment in an excellent and functional way. The internal layout allows you to use the space comfortably and then you can take advantage of useful spaces both for the living room and for the night part. The bathroom, also redone, has a window and has a shower. The property is completed by a cellar. 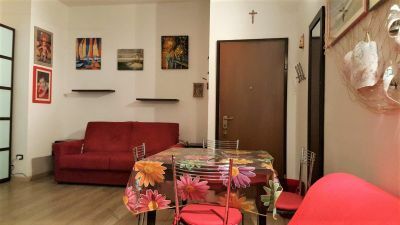 This studio for sale in Giulianova Lido, Via Cairoli, Viale Orsini, is perfect for those looking for a nice and small living solution to spend their holidays, but also for those looking for a property as an investment. A Giulianova Lido in the central area adjacent to Viale Orsini, for sale studio apartment on the ground floor of a stately building. The property for sale is the result of a recent renovation that allowed organize the environment in an excellent and functional way. The internal layout allows you to use the space comfortably and then you can take advantage of useful spaces both for the living room and for the night part. The bathroom, also redone, has a window and has a shower. The property is completed by a cellar.